Original, theatrical, fresh, and fun, the award-winning* Roxbury is as far from standard and boring as a couple can get. While the town of Roxbury is dull and sleepy, the motel is anything but. All the accommodations are decorated differently and exuberantly, with theme rooms inspired by pop culture of the 1960s and 1970s. As the property is a motel, some guest rooms are small; beds are queen- rather than king-size; and facilities that larger hotels contain, such as a restaurant and swimming pool, are not on site. What the motel lacks in amenities, though, it makes up for in style; anyone with a sense of humor will appreciate the Roxbury's tongue-in-chic design. *The Roxbury Motel is a winner of Tripadvisor Travelers’ Choice Awards. The Roxbury Motel is located SW of Albany, New York, NW from Woodstock, and pretty much in the middle of nowhere. And that's just how some guests like it. Since every room is different at the Roxbury Motel, you would be wise to select the one you want online ahead of time. An homage to the "I Dream of Jeannie" TV show, room #18 is styled in a retro Arabian Nights fantasy. Genie's Bottle Room is the most popular choice for honeymoon couples at the motel. Designed to give occupants the feeling they are actually inside a genie's bottle, the bathroom has a deep Japanese soaking tub and a palette that transports. Flash forward to the future in room #17, George's Space Pad. The bedroom is celestial white with silver accents and the rest of the suite is aglow with color. Since there's no movie theater for miles and miles, The Roxbury Motel has a large and growing collection of DVDs that guests may borrow. It includes the top 100 American Film Institute movies. Each of the TVs has a compatible DVD player. Designed to approximate a troglodyte's dwelling, Fred's Lair, room #12, contains a queen-size bed and a bust of a tyrannosaurus rex to guard the door. Romantic room #14, aka Golightly-a-Go-Go, creates the experience of sleeping inside a Tiffany blue box. Could there be a more perfect place to propose marriage? Also see: 10 Perfect Places to Propose. Like all the rest of the Roxbury Motel, the landscaping has been thoughtfully designed to please the eye. 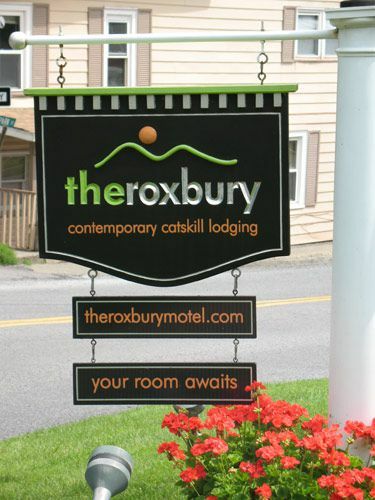 The Roxbury Hotel will appeal to outdoors lovers. Surrounded by rolling green hills and farm land, it's a good place to set out on a country drive and visit Cooperstown or Woodstock. More active guests can hike, swim in local creeks, go horseback riding or tubing, and golf. And from late spring to early fall, the nearby Round Barn farmer's market features fresh produce and other local items (we're partial to the irresistible Buddhapesto). Fall is the most beautiful season. Come for the foliage, and the motel can arrange to have rental bikes delivered and direct guests to the 25-mile-long Catskills Scenic Trail where trains formerly chugged. In winter, guests can ski at nearby Plattekill, Bellayre, Hunter, and Windham mountains. Although the Roxbury Motel's grounds would make a lovely setting for an outdoor wedding, ceremonies are not held here. But wedding parties often stay here. With one treatment room and a hot tub surrounded by windows, the intimate Shimmer Spa is perfectly sized for the number of guests at The Roxbury Motel. One honeymooner we encountered claimed that the massage he got here was as good as any he'd experienced at a 5-star hotel. A big guy, he also fit comfortably into the soft, white, fluffy robe that was provided. Like most motels, the Roxbury does not have a restaurant. What it does have is the neighboring East Branch restaurant, located a short walk from the property. In addition to this little restaurant, there's a cocktail lounge directly across the street from the motel. Called the Public Lounge, it serves as a stand-in for room service and will deliver to Roxbury rooms. A congenial spot to end the day and meet new friends, the fire pit lounge on the upper deck overlooks the gardens at the Roxbury Motel.